Carts are often perceived by pet owner’s as a last resort for their pets with mobility concerns. In rehabilitation we see the cart as a tool to assist in rehabilitation exercises and preserve the patient’s quality of life by keeping them an active member of the family. In this month’s blog we look at two pets that were fitted into carts for different reasons and their results. 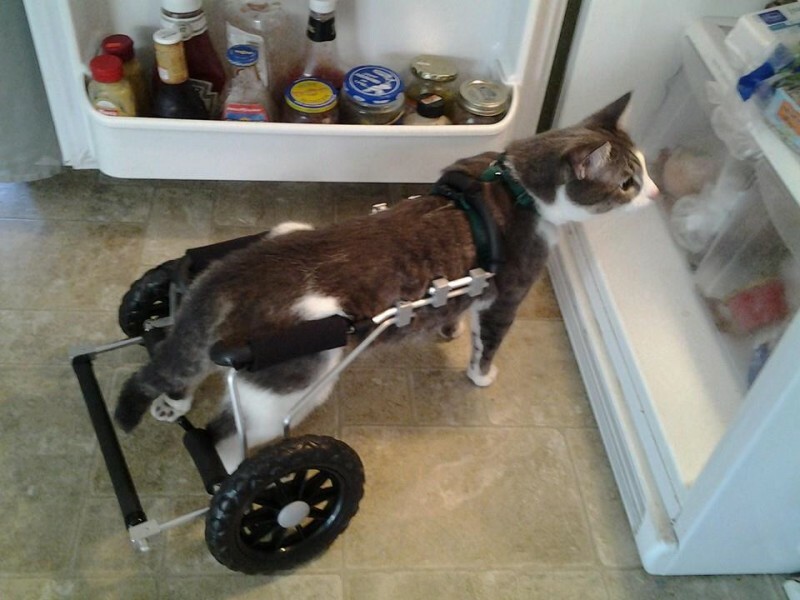 With his new wheels, Chance was able to discover refrigerators! Chance began to see us in April 2015, after he became unable to walk or use his hind limbs to even stand for over a month. With rehabilitation and acupuncture, Chance began to use his hind limbs again. His foster mom would stand him up to do his exercises in a more natural position. In the summer, Chance began to realize things that he couldn’t reach would be brought to him, so it was easier to wait for toys and food to come to him. He did not want to try to walk, he reached a plateau. Chance got his cart that August and adjusted to it very quickly. He began to keep up with the other pets in the house, run from window to window looking at birds, and kicking his hind limbs in the cart as he ran. He decided that being up on all four legs, even with wheels was better than crawling. His foster mom was able to do more exercises also because she had a helping hand.